Why are children more susceptible to colds and flu? How are coughs, colds and flu usually treated? How has ComfiCoff helped others? How do I use ComfiCoff? While coughs and colds are common in adults and children alike, children are especially prone to developing infection as their immune systems are not yet as strong as those of adults. Children are also frequently in contact with other children in schools, creches and day care centres, where contagious viruses are difficult to control. For some parents, it seems that their children are always sick with one cough and cold after the other, with repeated antibiotic treatment compromising the functioning of little immune systems. In compliance with Health Department regulations, Feelgood Health does not make any medical claims that its products, including ComfiCoff, are intended to diagnose, cure, treat or prevent any disease, including upper respiratory tract infections. Please note that this information is offered for educational purposes only and is not intended to be a substitute for professional medical attention. When in doubt, please consult your health practitioner. Coughing is a symptom of an underlying infection or illness and is the body’s way of removing irritating substances, excess secretions, and foreign objects from air passages. This is important, both as a protective mechanism and for the healing process - which is why a cough should not be artificially suppressed with drugs. When a cough is painful, too intense, or prevents good rest, the use of natural remedies can gently relieve discomfort and help with recovery. Productive coughs help clear and protect the lungs from infectious mucus, whereas non-productive coughs are usually the result of an irritation in the throat. The most common causes of coughs in children are colds and 'flu, which are infections mainly involving the upper respiratory tract. Colds and 'flu are caused by viruses and can have many of the same symptoms. A cold is generally milder, while flu tends to be more severe. There are more than 100 different viruses that can cause the common cold. 'Flu is also caused by viruses - the Influenza virus. There are fewer viruses that cause 'flu and this is why a vaccination can be produced. Childrens’ immune systems are not as strong or well-developed as those of adults, making them more vulnerable to infections of all types. Children who go to kindergarten, day-care and after-care are particularly at risk as they come into close contact with many other children every day and we all know that hygiene and hand-washing are not always top priorities for little ones! Coughs, colds and flu are usually treated with bed-rest and symptomatic medication until the body’s own immune system overcomes the infection. There are no allopathic medications to cure colds or flu. Although antibiotics are sometimes prescribed, they are not effective against viruses and will only help in the case of secondary infections. Many of the commercial cough mixtures available contain a variety of side-effect producing substances. Cough mixtures designed to “open up the airways” often contain stimulants which can cause anxiety, tremors and dizziness. Cough suppressants often contain codeine derivatives which can sedate your child and may lead to constipation. Not to mention that most cough mixtures are also very high in alcohol and sugar! Over the counter medicines like paracetamol, as well as various other cough and cold products are also often used to treat symptoms. However, many of these also come with side effects. Decongestant drugs can be very effective but cause side-effects like increased irritability and hyperactivity. They can also “over-dry” the nose and mucus membranes- causing discomfort. It is also important to remember that all of the symptoms of colds and flu (e.g. coughing, sneezing and running nose) are nature's way of trying to drive the virus from the body and one should therefore take medicines like cough suppressants and decongestants with caution as they can prolong the illness and even make it worse in the long run. 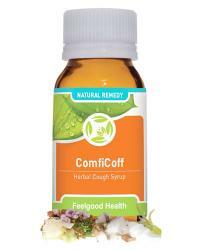 ComfiCoff is a complex cough remedy containing both herbal and homeopathic ingredients. ComfiCoff is 100% safe and natural and the ingredients are combined in therapeutic dosages to provide rapid and effective relief. This tasty cough syrup is suitable for both children and adults and contains no harmful ingredients such as stimulants and codeine found in many over the counter cough syrups. ComfiCoff can therefore be safely used to help children and adults alike, without any unwanted side effects. ComfiCoff will soothe and relieve all types of coughs while promoting relaxation and restful sleep. Like all Feelgood Health products, ComfiCoff is developed with care by our practising Clinical Psychologist, is 100% natural and manufactured according to the highest pharmaceutical standards. Individual ingredients are well-researched and have been specially chosen for their high safety profile. “I usually never give my children much for coughs and colds (because I know it is a viral infection) but I decided to try ComfiCoff as it is a natural remedy and not one of those horrible commercial cough mixtures. And am I glad that I did! It really helped my boys’ coughs and allowed everyone to rest and get better”. As an ex-smoker of 12 years (and still counting!) I have a persistent tickle and mucus in my throat with a need to constantly clear it which is irritating to me and to others. I have tried a bunch of stuff with little success, but I feel I have finally found the solution with your Comficoff syrup which helps tremendously!" Althea Officinalis (Marshmallow) has been used since ancient Greek and Roman times. It contains large sugar molecules called mucilage which exert a soothing effect on mucous membranes and is therefore an effective treatment for respiratory catarrh, irritating coughs and infections. This soothing herb helps to reduce all types of inflammation and will relieve dry coughs and sore throats. Hyssopus Officinalis (Hyssop) is one of the oldest medicinal herbs and has its healing powers extolled in the bible – “Purge me with Hyssop and I shall be clean”. (Psalm 51:7) It is used to assist the body with respiratory problems, such as coughs and congestion, as well as to boost immune functioning and thereby help to relieve fevers and inflammation. Sambucus Nigra (Elder) soothes coughs and inflammation by increasing bronchial secretions. It is also a valuable aid to loosening phlegm and decreasing congestion. As a diaphoretic herb (causing perspiration) it is useful for relieving fever. Recent research has shown that Sambucus Nigra also contains compounds that are active against several strains of flu viruses. Glycyrrhiza Glabra (Licorice Root) has long been known for it’s ability to soothe respiratory inflammation and calm coughs. In addition Licorice root has powerful immune-boosting, anti-inflammatory and anti-viral properties, helping to fight infection. Pulsatilla (30C) is a homeopathic remedy for treating inflammation of the respiratory passages, coughs and colds. Pulsatilla is particularly useful for tight, chesty coughs and its anti-spasmodic action helps to relieve sudden outbursts of coughing. In addition it promotes relaxation and good sleep. Bryonia (30C) is another homeopathic remedy that is very effective in treating coughs, most particularly painful and dry coughs associated with a tight chest and dry mucous membranes. Bryonia helps to clear mucous from the chest. Kali Mur (6C) is a biochemic tissue salt that is very useful in clearing mucous, relieving coughs and soothing sore throats. In addition Kali. Mur. will help to reduce inflammation and remove toxins from the body. Ferrum Phos (6C) is another biochemic tissue salt which has many uses in the body. The most important benefits are in the ability of Ferrum Phos. to combat all types of infection and inflammation. Ferrum Phos. is an excellent cough remedy especially for tickly coughs. Ferrum Phos. also helps to strengthen the walls of the blood vessels and thus improves the body's ability to distribute oxygen-rich blood and iron to all cells, thereby facilitating healing. An excellent Tissue Salt for the treatment of sore throat, fever, colds and bronchitis and aching bodies, Ferrum Phos. is recommended at the first stage of any infection for fast resolution of the symptoms. All the above ingredients are combined in a 100% safe and natural Tolu Syrup and Glycerine base. Repeat 3-4 times daily or as needed. Caution: Not recommended for babies under 12 months or during pregnancy unless under medical supervision. Coughing should be soothed within several minutes of giving the first dose of ComfiCoff. Continued improvement will be noticed over the following days. This will depend on the dosage and frequency needed. Each bottle contains 50ml.